I picked up this little gem at Barnes and Noble yesterday. Fairy Tale Fortune Cards is a Lenormand deck, though for some reason it is not being marketed as such. The set contains 36 Lenormand cards and a 95 page book. This set has a few charms up its sleeve. First, it's a modern take on an old system, using bold colors and simple striking imagery. The artwork will appeal to younger audiences and those young, colorful and spirited at heart. The second charm is experienced when you open the book. 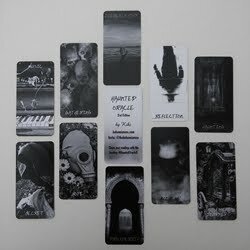 Each card is related to a fairy tale, which is a new unique take on explaining the meanings of the cards. Quite a refreshing change from the typical boring LWB for sure. The box which houses the deck and book is like that of the Fallen Angels Oracle deck, opening at the side. I love this particular box that Cico Books offers, and it was a selling point for me. I like the sturdiness of the thick box and the fit of the lid. Unlike the Fallen Angels box (whose cards just flail around inside the big box), this one actually came with a cardboard nook inside designed to separate the book from the cards, although some of the thin cards fall through anyway. Not a huge deal. Upon opening the box, the cards were out of order, which was strange. When I open a new deck, I like to look at the cards in order. It just suits my brain better that way. This deck came already shuffled. Again, not a huge deal, just a bizarre thing. The cards are quite big for a Lenormand deck. They measure 3 1/8 x 5 1/8 ". They are very thin, very flexible and very glossy. I really, really like the images on the cards. I love simplistic symbolic imagery. 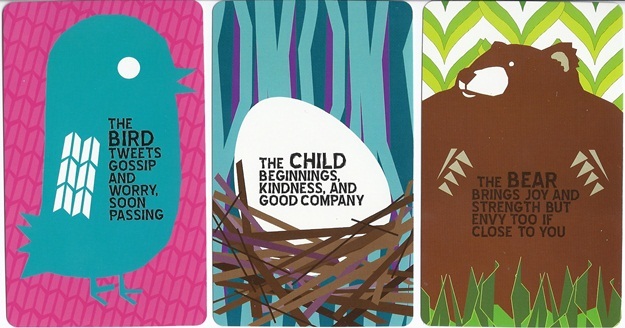 The minimalist artwork makes the cards stand out without superfluous details. And the coloring is bright and fresh and grabs your attention. The backs are reversible, although the deck is not designed to use reversals. The pattern on the back is kinda ... meh. (See image below.) It's a bunch of diamond designs using 70's colors... browns, green, blue. Since the deck is so bright and vibrant, I expected a more cheerful colored back design. But I don't really care one way or another about the backs of my decks. There are words printed on each card, which is annoying when you already know the meanings of the cards. So I think the deck is geared more toward a younger audience, or one that hasn't been introduced to Lenormand or card reading yet. 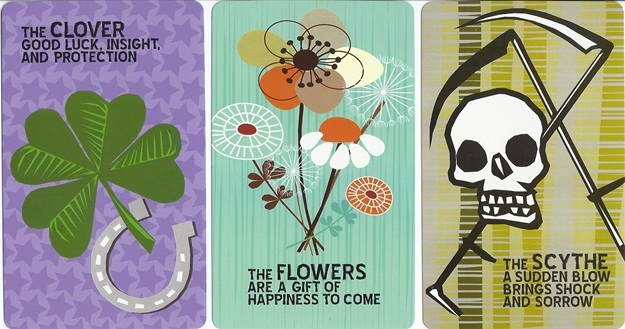 Still, once you get to know the cards, you hardly need the meanings branded on them forever. I would have enjoyed the deck more if it came without the wording on them. The Man and Woman cards are very cute. Instead of showing human figures, they show only symbols. The Man card has a top hat, cane and mustache. The Woman features a high heeled shoe and fan. The Bird card features a blue cartoon bird that reminds me of Twitter. It even has the word "tweet" on it: "The bird tweets gossip and worry, soon passing." I wonder if this similarity to Twitter was deliberate. The Star is a little strange to me, as the main illustrations are snowflakes. While there are a few tiny stars on the card, I would have rather seen stars as the main feature on the Star card. 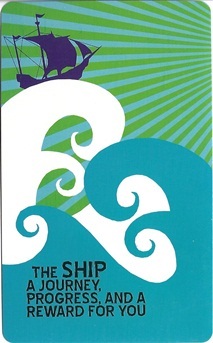 I love the little twist on the Cross card: "A burden to bear and maybe a spirit nearby." Oooh! 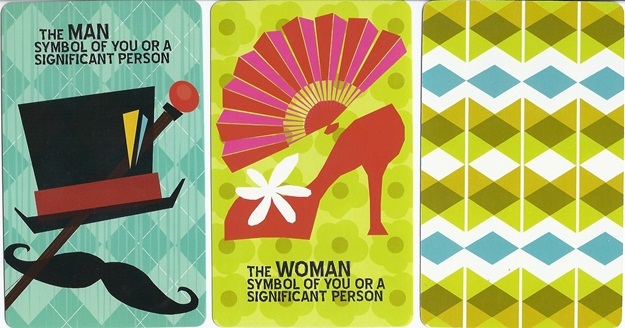 Some of the cards indicate different meanings depending on their proximity to your Significator card. 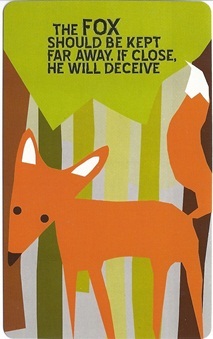 Examples: "The Fox should be kept far away. If close, he will deceive." and "The Bear brings joy and strength but envy too if close to you." This is different from the Lenormand system I am used to. It sounds more like the Gypsy Witch deck and method of reading. An interesting combination that the author shares is that of Fox + Stork. "Fox with the Stork: Children. In this combination, the Fox loses its negative aspects and represents motherhood and young ones." The book contains several combinations that I hadn't heard of, which you can take or leave depending on your desires. This deck reads incredibly clearly. It's very straightforward. Since I already have a system by which I read the Lenormand, I just read them as I would any other Lenormand deck. 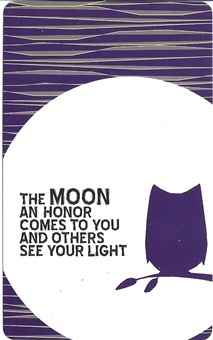 There is something about the simplicity and brightness of the cards that makes it very easy to relate to. The answers pop out from the cards quite easily. The accompanying book is 95 pages. It's full color, which is nice, with very nice quality paper. 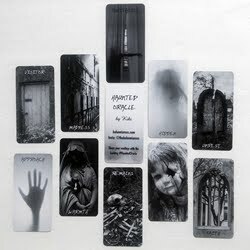 There is a fairy tale to go with each card, accompanied by a color image of each card. Each fairy tale page is typed on a different background, each matching the background of the card its describing, which I thought was a really cool touch. 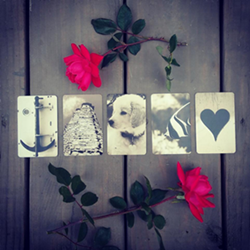 For each card, there is a fairy tale which incorporates the symbol of the card. This is followed by a brief note connecting the moral of the tale to the card in the deck. On the opposite page is the image of the card, a small explanation of the meaning (with notes on the proximity of the Significator card, if applicable), a few card combinations, and the playing card attribute. I'm not sure how the author chose which few card combinations to feature. The book gives the idea that the combinations listed are the only special exceptions with which to read combos. Lenormand is a system of reading that heavily relies on card combinations, and it isn't limited to the ones listed in this book. There are several spreads in the book. 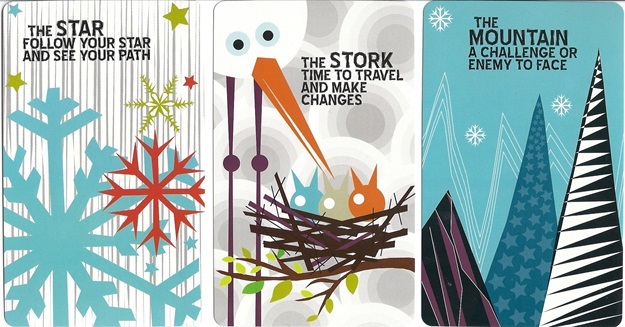 The first three (Past-Present-Future, Week Ahead, Year Ahead) each use one card per position. No combinations are read. The Near and Far spread has pairs of cards surrounding your Significator card, but again, they are read as single influences, and not read as combinations. Only their proximity to the Man/Woman card is considered, if at all. 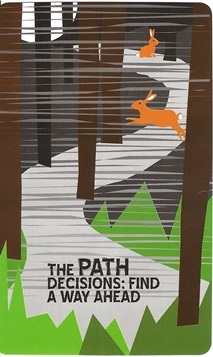 There is a Yes or No reading, attributing certain cards as yes, others as no, and still others as "pull another card". The most interesting spread in the book is the last one, called The Master Method. It uses all 36 cards, but ultimately a block of 9 is all you read. Each of the 36 positions has a different meaning. It's not to be confused with a Grand Tableau spread and house positions (which isn't mentioned in the book at all). If you are planning to use this deck as a regular oracle, and not read it as a Lenormand, then the spreads included are fine. But if you are going to use it like a Lenormand, you really need to read it as such, in spreads designed to utilize the card combinations and seeing how the cards relate to each other as a group. Reading each card alone doesn't really give you a good Lenormand reading the way it was meant to be read. 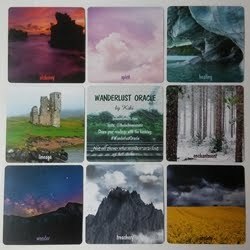 I'm very glad to have happened upon this modern, bold version of a Lenormand deck with a fairy tale twist. 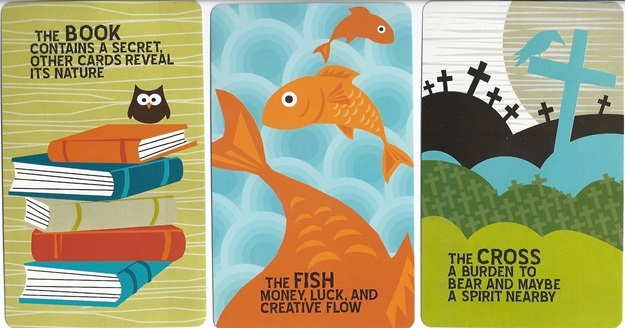 The cards are really fun to use and I enjoyed reading the fairy tales that accompany the cards. I'll definitely continue using this deck with delight. 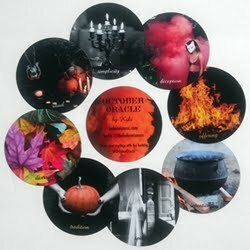 This oracle deck review was originally published on my previous blog (Tarot Dame) on 11/6/12.